Here we go again. The United States has been rattled to the core by an unspeakable act of evil perpetrated by a hater of humanity. A quiet, wealthy loner rented a hotel suite in Las Vegas, armed it with shooting platforms and automatic weapons, knocked out two of the windows, and shot at innocents 32 floors below. Fifty-nine people were murdered, and 527 were injured. The killer used rifles that he purchased legally and altered illegally. He effectively transformed several rifles that emit one round per trigger pull and present the next round in the barrel for immediate use (semiautomatics) into rifles that emit rounds continuously when the trigger is pulled -- hundreds of rounds per minute (automatics). Though some automatic rifles that were manufactured before 1986 can lawfully be purchased today with an onerous federal permit, automatic weapons generally have been unlawful in the United States since 1934. Even the police and the military are not permitted to use them here. I present this brief summary of the recent tragedy and the implicated gun laws to address the issue of whether the government can keep us safe. Those who fought the Revolution and wrote the Constitution knew that the government cannot keep us safe. Because they used violence against the king and his soldiers to secede from Great Britain, they recognized that all people have a natural right to use a weapon of contemporary technological capabilities to protect themselves and their liberty and property. They sought to assure the exercise of this right by enacting the now well-known Second Amendment, which prohibits the government from infringing upon the right to keep and bear arms. When the Supreme Court interpreted this right in 2008 and 2010, it referred to the right to keep and bear arms as pre-political. "Pre-political" means that the right pre-existed the government. It is a secular term for a fundamental, or natural, right. A natural right is one that stems from our humanity -- such as freedom of thought, speech, religion, self-defense, privacy, travel, etc. It does not come from the government, and it exists in the absence of government. The recognition of a right as fundamental or natural or pre-political is not a mere academic exercise. This is so because rights in this category cannot be abrogated by the popular will. Stated differently, just as your right to think as you wish and say what you think cannot be interfered with or taken away in America by legislation, so, too, your right to own, carry and use arms of the same sophistication as are generally available to bad guys and to government officials cannot be interfered with or taken away by legislation. That is at least the modern theory of the Second Amendment. Notwithstanding the oath that all in government have taken to uphold the Constitution, many in government reject the Second Amendment. Their enjoyment of power and love of office rank higher in their hearts and minds than does their constitutionally required fidelity to the protection of personal freedoms. They think the government can right any wrong and protect us from any evil and acquire for us any good just to keep us safe, even if constitutional norms are violated in doing so. Can the government keep us safe? In a word, no. This is not a novel or arcane observation but rather a rational conclusion from knowing history and everyday life. In Europe, where the right to keep and bear arms is nearly nonexistent for those outside government, killers strike with bombs and knives and trucks. In America, killers use guns and only stop when they are killed by law-abiding civilians or by the police. The answer to government failure is a candid recognition that in a free society -- one in which we are all free to come and go as we see fit without government inquiry or interference -- we must be prepared for these tragedies. We must keep ourselves safe, as well as those whom we invite onto our properties. 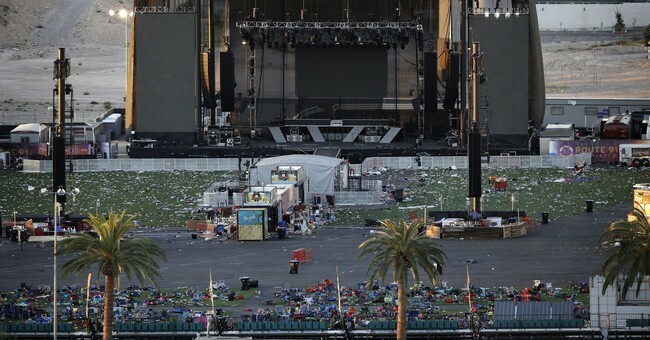 Surely, if the president of the United States were to have appeared at the concert venue in Las Vegas to address the crowd, the Las Vegas killer would never have succeeded in bringing his arsenal to his hotel room. Government always protects its own. Shouldn't landowners who invite the public to their properties do the same? Add to government's incompetence its useless, intrusive omnipresence. In present-day America, the National Security Agency -- the federal government's domestic spying agency -- captures in real time the contents of every telephone call, email and text message, as well as all data sent over fiber-optic cables everywhere in the U.S. Thus, whatever electronic communications the Las Vegas killer participated in prior to his murders are in possession of the federal government. Mass surveillance is expressly prohibited by the Fourth Amendment, but the government does it nevertheless. It claims it does so to keep us safe. Yet this exquisite constitutional violation results in too much information for the feds to examine in a timely manner. That's why the evidence of these massacres -- from Sandy Hook to Boston to Orlando to San Bernardino to Las Vegas -- is always discovered too late. At this writing, the government has yet to reveal what it knew about the Las Vegas killer's plans before he executed them and executed innocents. This leaves us in a very precarious position today. The government cannot keep us safe, but it claims that it can. It wants to interfere with our natural rights to self-defense and privacy, but whenever it does so, it keeps us less safe. And in whatever arena it keeps us less safe and falsely fosters the impression that we are safe, we become less free.